Google on Thursday unleashed its own free web application vulnerability scanner tool, which the search engine giant calls Google Cloud Security Scanner, that will potentially scan developers' applications for common security vulnerabilities on its cloud platform more effectively. Despite several free web application vulnerability scanner and vulnerability assessment tools are available in the market, Google says these website vulnerability scanners are typically hard to set up and "built for security professionals," not for web application developers that run the apps on the Google App Engine. While Google Cloud Security Scanner will be easier for web application developers to use. This web application vulnerability scanner easily scans for Cross-Site Scripting (XSS) and mixed content scripts flaws, which the company argues are the most common security vulnerabilities Google App Engine developers face. 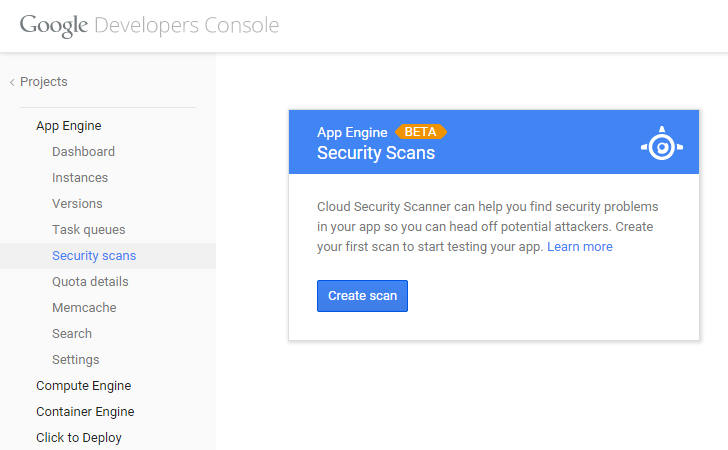 The developers can access the Cloud Security Scanner under Compute > App Engine > Security in Google's Developers Console. This will run your first scan. It does not work with App Engine Managed VMs, Google Compute Engine, or other resources. Use a real browser – This approach avoids the parser coverage gap and most closely simulates the site experience. However, it can be slow due to event firing, dynamic execution, and time needed for the DOM to settle. Security Engineering head Rob Mann says that their web vulnerability scanner uses Google Compute Engine to dynamically create a botnet of hundreds of virtual Chrome workers that scan at a max rate of 20 requests per second, so that the target sites won’t be overloaded. "Cloud Security Scanner addresses the weaknesses of [real and emulated browsers] by using a multi-stage pipeline," Mann wrote in a blog post. "As with all dynamic vulnerability scanners, a clean scan does not necessarily mean you're security bug free." The search engine giant still recommended developers to look into manual security review by a web app security professional, just to be on the safer side. However, the company hopes its vulnerability scanner tool will definitely provide a simple solution to the most common App Engine issues with minimal false positives.